The Tulsa Wanamaker Gun Show in April was a big success. It was a strong show for those really wanting to sell some firearms – money was changing hands. We came back with a few new restoration projects including a Winchester Model 90 and a Winchester 1886 for some restoration and prep work. 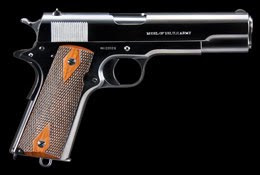 While there, we also sold a few Turnbull Restored Early Colt 1911 (pictured here). This show is one of the largest in the US (if not the biggest) – covering 12 acres indoors of exhibitor space. The “in” thing this year was sporting arms.